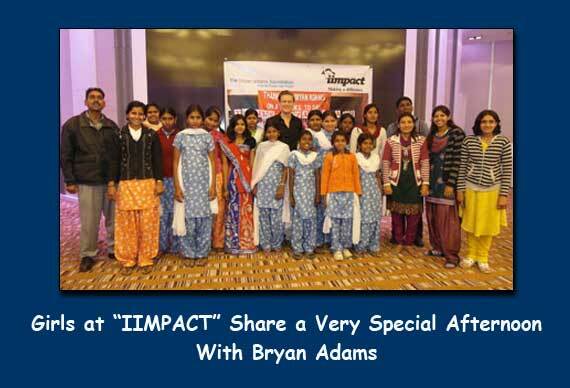 Bryan Adams, the world famous Grammy award winning singer-songwriter, is an ardent supporter of IIMPACT. The Bryan Adams Foundation and IIMPACT together educate 600 out-of-school and never-been-to-school in the villages of Jaipur district in Rajasthan. Bryan Adams Foundation and IIMPACT thus share a common belief that education is the best gift that a child can be given. During his recent visit to Delhi Bryan Adams set aside some of his valuable time to share some very special moments with 16 IIMPACT girls from his supported centres, along with their teachers and members of the IIMPACT team. These young girls traveled all the way to the capital from remote villages in Rajasthan, visiting a large metro for the very first time in order meet with the singer. Bryan personally met and interacted with each of the girls. The girls presented Bryan with special traditional Indian musical instruments – the Sarangi and a Bansuri ; the singer was delighted as the teachers showed him how to play these instruments. The girls sang songs personally compiled by them for the occasion, the words of which thanked the star for his valuable support, letting him know that he holds a special place in their hearts. They also enthusiastically sang one of his songs – ‘ On a Day Like Today’ which was very beautifully rendered – taking the singer by complete surprise. Some of the girls performed tradional Rajasthani folk dances in their colourful lehengas. Bryan Adams was charmed! Bryan captured these very special moments, continuously taking pictures with his personal camera. The girls and IIMPACT staff encouraged Bryan Adams to dance along with them to some of the lively folk music being played. He won everybody’s hearts as he sang a few lines from his songs. One of the young girls innocently blurted out loud ‘ Yeh to bahut accha gate hain !’ (‘He really sings very well !“). This has indeed been a very meaningful experience for all at IIMPACT and this will be a day that these young IIMPACT girls will never forget. The support of Bryan Adams Foundation continues to change the lives of the poor children, just like his music changes the lives of millions across the globe.